Tecboss 3D Pen- To Draw Your Dreams on Your Way! 1.Connect power and press [Filament Load Button] to heat up. 1.Children should use it with adult supervision. Wonderful Gift for Kids & Adults:【NOTE】Buy upgraded M1 3D pen, you will get 20 Color 3D Printer Filament free. Please add both to cart first. 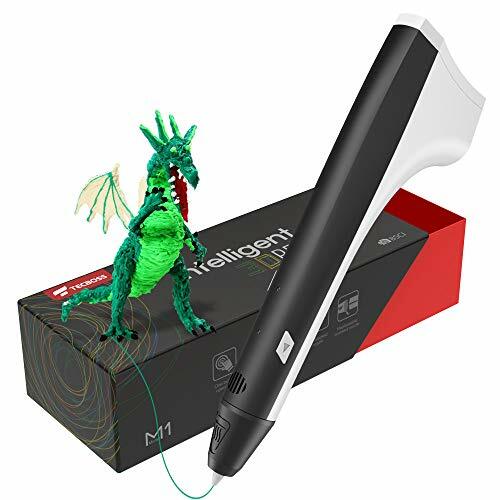 Tecboss 3D printing pen is a perfect gift that promote children to improve spatial thinking, cultivate creation and artisric skills. Environmental Friendly Material: Tecboss M1 3d pen is compatible with PLA material; the package are included 2 pack free PLA filament for test. the PLA filament is a more eco-friendly, safer material than ABS. One Button Control & Advanced Intelligent Chip: M1 is featured with one button control for drawing; as easy as writing ;integrated with new intelligent chip for steady temperature and constant speed control for a much smoother experience. USB Power Supply: Tecboss 3d printing pen can work both with power bank , computer laptop or AC USB adapter. Make sure that the current is 5V/2A. PACKAGE INCLUDES: It includes the M1 3D printer pen, USB charge cable, power adapter, remove tool, PVC transparent board, 2 PLA filament refills, 2 silicone fingertip protectors and instruction manual guide.